Defenseman Simon Despres gave Penguins fans a glimpse of one of the future team cornerstones during his 13-game NHL stint in Pittsburgh. For Despres, who was returned to Wilkes-Barre/Scranton Sunday, his yearlong accolades continue to pile up. He was named to the Eastern Conference Team in the 2012 American Hockey League All-Star Classic Jan. 29-30 at Boardwalk Hall in Atlantic City, N.J., along with WBS teammate Colin McDonald. "It's a great honor," Despres said. "Wiith all the great players in the league it really is an honor. I'm proud and very happy. "My teammates and coaches were a big part of my success. Everyone in the organization helped me." Despres, Pittsburgh’s first-round pick (30th overall) in the 2009 NHL Draft, posted four points (1G-3A) and a plus-4 rating while making his NHL debut this season. What’s most impressive is that the 20-year-old blueliner didn’t look out of place among the seasoned veterans in the NHL. Despres played his first NHL game and recorded his first point (assist) Dec. 1 at Washington. Despres scored his first goal (on a power play) Dec. 17 against Buffalo off a nice one-timer shot. "I learned little details," he said of his time in the NHL. "I learned a lot from guy like (Brooks) Orpik and all the good defenseman in the organization. I tried to get the most out of it and bring that back to Wilkes-Barre." Despres is in his first season of professional hockey. 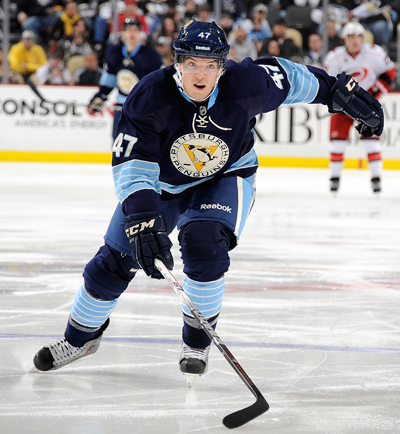 With WBS, the 6-foot-4, 205-pound defender has seven points (3G-4A) and a plus-3 rating in 22 contests. Despres finished a storied four-year Junior career with a dominant 2010-11 campaign. An alternate captain with Saint John of the Quebec Major Junior Hockey League, Despres helped the Sea Dogs win the QMJHL championship and Memorial Cup in 2011. He won the Emile “Butch” Bouchard Award as best QMJHL defenseman in 2011. Despres then added a silver medal to his trophy closet as a member of Team Canada in the World Junior Championships in Buffalo. And only a few months later Despres made his NHL debut (and sometimes endured being the victim of some good rookie pranks). While the awards and accolates keep pouring in, one thing is for sure, this All-Star has a bright future in the NHL.